A week or so ago, I met an old friend for a drink after work, and I was delighted to hear him suggest we should go for some tapas at this great little place he knew. Bravas has been operating only for a few months and its easy to see why it has proven one of the most popular this end of Bristol. Some of the food we ate was simply sublime, the Iberico Pork cooked rare was simply melt in the mouth brilliance, and the chick peas with cumin were equally up to the task. But my purpose of being here was to give a little review of some of the booze we had this particularly long and sociable evening. If you want to have a better review of the food I would redirect you to the review Emily gave. Whenever I go abroad, I always try the local booze. It is always, I find, the best match for the food I have on my plate. So when in a Spanish place, always try something Spanish. I was delighted to see an all Spanish wine list, including a couple of sherries which I will get into a bit later. To start with the evening was just going to be a couple of beers, and something caught my eye that I hadn’t had before, Camden Brewery American Pale Ale. What a taste sensation. The nose gives off fresh grapefruit and orange, whilst the palate is dry, rich and beautifully hoppy. The finish is beautifully bitter and perfectly balanced. It is a really good beer that I could have drunk all day. Just my style! So after we had supped a few beers, the munchies started approaching and we ordered some food. I was keen to try the sherries with the tapas as I do suffer from something I like to call ’the Manzanilla effect’. For me, sherry only seems to make sense when eating Spanish food and doing something typically Spanish. Trying sherry at 9am on a dank horrible day in Watford with the post commute malaise kicking in is just not the right environment. 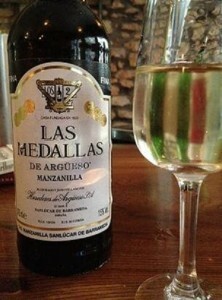 We kicked off with a beautiful Manzanilla from Argueso called Las Medallas. It was just wonderful on its own as a little aperitif. The nose had a bracing note of entering a fish market, this was balanced with a lovely note of bitter lemon and tea. The palate was bone dry with a lovely salty tang on the mid-palate. We got on with this so well, we decided to have another half bottle with the food and it partnered all the dishes perfectly well. With our salt chocolate truffles, we decided to have something a little sweeter, so we decided to go with something off the main menu. Pedro Ximenez is usually the sweetest sherry, and this little beaut was no exception. Made by Hidalgo, one of the finer Bodegas in my opinion, this really ticked all the boxes PX should. Lovely nose of molasses and raisin, with just a hint of sweet grape juice and dark nuts. The palate however was fine and sweet and much lighter than the nose suggested. It actually tasted more like a sweet black muscat dessert wine than a normal PX, lovely grapey sweet palate, and just a hint of coffee. It finished with a lovely lick of acidity that just took away any potential stickiness on the back of the throat. On a side note, the truffles we ordered were so good, that just after another two friends arrived, we ordered another two portions. Simply amazing! And so the evening went on and as a little finisher we decided to go for an espresso and a brandy. Something else not on the main menu was this Spanish brandy, heartily recommended by our gracious host Kieran, Cardenal Mendoza from Bodegas Sanches Romate. It is nice to know that there are things out there that I still have no idea about. I have not tasted a brandy that has been aged like this before, indeed I didn’t know this sort of thing existed. It is a normal brandy, aged in American oak, and then put through the solera system (the process that they make sherry with), although they only use barrels that have made PX and Oloroso which are two of the sweeter sherries. In truth this was almost like a PX in its character, but with a brandy edge to it. Thick bodied, unctuous, and pure heaven to drink. None of the hard edge you get in some brandies, this was just pure pleasure in a glass. Nutty and fruity in equal measure, with touches of coffee and liquorice, it really did round off the evening well. For a lot of people, sherry is a hit and miss affair. True it is a little bit of an acquired taste, but when partnered with the right food, as is served extremely well here at Bravas, it really does take on a whole new character. I urge people to try Bravas, make sure you arrive early though as it does get very busy, which is only a testament to how good it is. I also urge you to try sherry next time you eat something Spanish! There is every type of sherry out there from bone dry and light to thick and sweet, and you are sure to find something attuned to your palate!